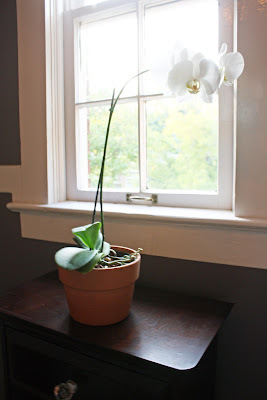 We've had a great orchid in the bathroom for awhile. It's so happy in the north-facing window that I was scared to move it, but the terra cotta pot wasn't what I was envisioning for the bathroom. Buhhhh... See what I mean? 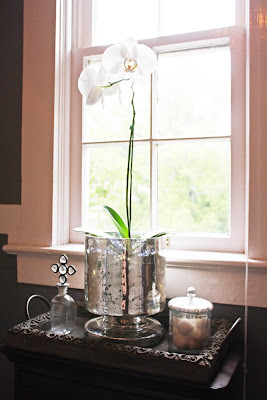 For well over a year I've pictured our cabinet dressed up with pretty little apothecary jars or mercury glass accessories, but there aren't many options for a mercury glass plant pot that an orchid can fit into. To give you and idea of what I'm talking about, I'm issuing a challenge. Find a beautiful mercury glass dish that's at least 7" wide and tall enough for an orchid pot. You have one hour. 1, 2, 3, GO! What, you didn't find anything? Ah, I know the feeling. But don't fret, dove. Don't fret, diva. I've got your back. At first it looked disproportionately LARGE sitting on the cabinet all by itself. But after heading into a local store (Three Sheets, a sweet store in Homewood) I found a pretty little tray and two darling accessories that seemed to make everything come to life. Some detail shots for your pleasure. It's kind of incredible how much cozier and more glamorous it looks. Don't you think? I really love the character it brings into our teeny tiny bathroom. What do you think? What are your favorite accessories in the bathroom? Taken a liken' to mercury glass as much as I have? 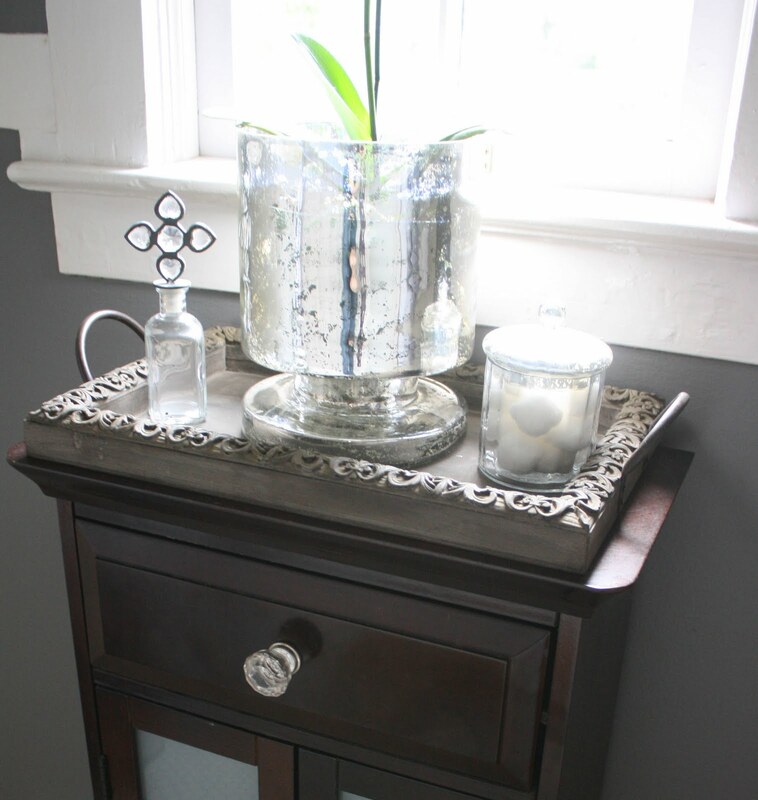 Any new additions to your bathroom? Ya remember when we went to the beach for my birthday? 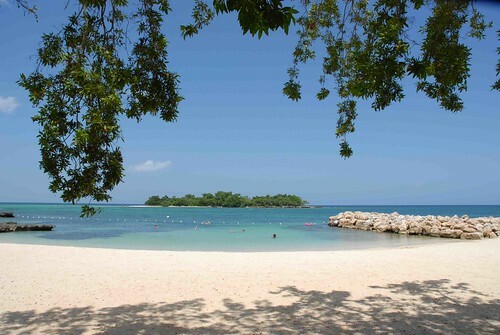 We sun-bathed. We relaxed. We cursed at non-existent internet connection and lack of 3G access. We also went thriftin'. And Seth was actually happy with the idea. Wow. My birthday week dreams came true. He was on the hunt for vintage tees... and I was pumped to check out the goods in a different city. Now mind you, I didn't have any real expectations. Just wanted to have some fun on the way to oyster-and-wine-ville. Imagine my surprise when I walked over to Seth and his eyes were lit up: "This place is a goldmine! Look at these t-shirts!". He was having as much fun as I was. Thrifting. Happiness, I tell ya. And I found a few goodies, too. Namely these Avon After Shave bottles in the shape of chess pieces. I picked out the best of the bunch, at the tune of $.79/piece to style some bookshelves. Love. Them. And here they are on our built-in bookshelf in the living room. Notice the moss letter? 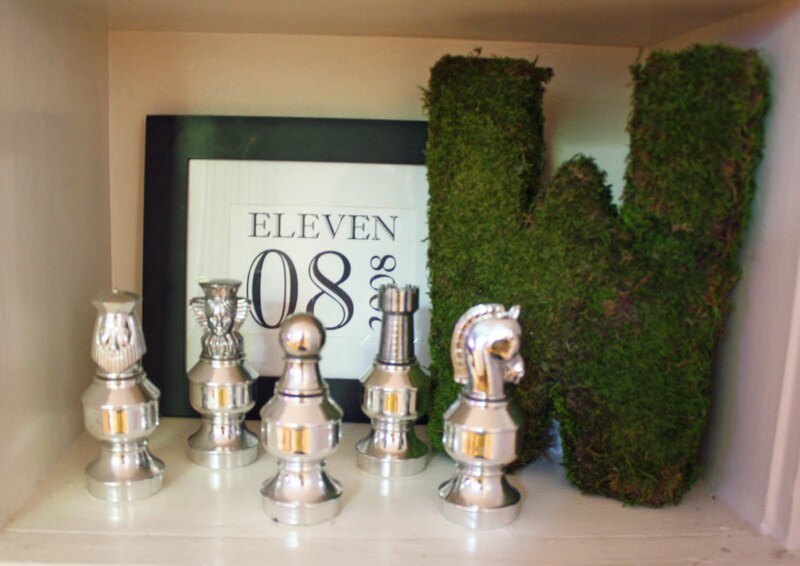 It's finding a new place soon, but I like the cool and texture plays against the silver chess pieces and the graphic print (a gift I made for Seth for our first anniversary). They're shiny and quirky, and remind me of a great afternoon we had together at the beach. Hope to hold onto these for a long time. Bonus: If we ever need old, terrible smelling after shave, I know right where it is! Find anything yourselves recently on a dime? Or anything completely unexpected you just couldn't leave without?